In her premier picture book, Bartles presents a delightful twist on the princess-kisses-a-frog fairy tale. Princess Cassandra is as pampered as a princess can be. She has hundreds of dresses and thousands of books, but she has no pet to match her favorite dress. The Royal Pet Keeper sets out to find her the perfect pet. He searches high and low until he happens upon the perfect green frog. Cassandra is elated. She and the frog jump and play all day. When she kisses the frog good night, he turns into a prince. Unacceptable. She has the same result with frog after frog until the palace is overrun with princes. 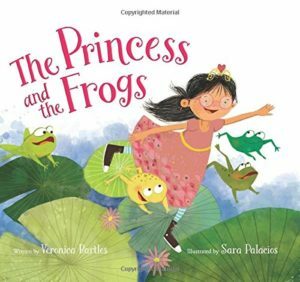 Cassandra finds one prince who only wanted to be a frog. Perfect. One more kiss turns him back to a frog. Charming illustrations enhance and expand the story as written. Frogs slide down bannisters with Cassandra, share sodas with her, and jump rope. Princes slide down bannisters, hang from chandeliers, and use dresses for kite tails. This is most fun as a read aloud so kids can guess about the next parts of the story. It’s fun looking for what makes each frog and each prince unique.